Our Canoe Paddle Art is a Unique Form of Art. Made of Aspen wood, each paddle is three feet long and presents a Beautiful Work of Art, as nice as a framed print. Each canoe paddle has leather lace wrapped around the shaft-handle. Each paddle is equipped with a wall hanger and string, so that it can be mounted easily by the homeowner. All you need is the hook or nail in order to hang the canoe paddle. A signed and numbered certificate of authenticity from Greg Alexander will be on the back of each paddle. For Decorative Purposes Only - Wood is assumed to have individual characteristics and some imperfections. 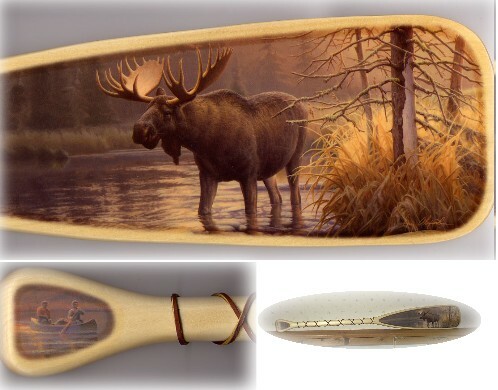 Our Decorative Wildlife Canoe Art Paddles are made of Aspen Hardwood. Each Paddle is 36-inches Long x 6-inches Wide. The handles are cross-stitched with leather, and include a 2nd decorative symbol of the paddle theme on the top of the paddle. A hanger is included on the rear of each paddle for easy installation. All you need is a nail. 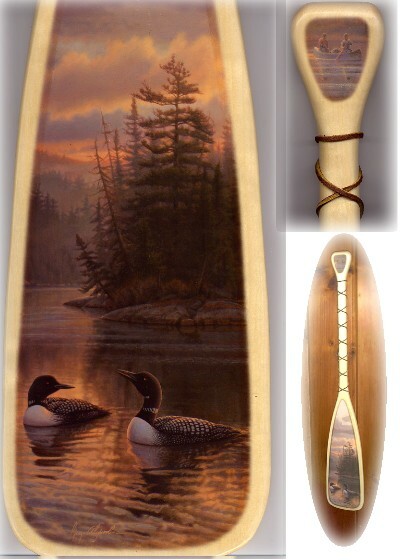 See our Art Paddles for a more selections. Makes the Perfect gift for the fisherman, outdoors enthusiast, or for the naturalist. Affordably Priced. Note: Typically, wood is assumed to have individual characteristics and some imperfections. We cannot guarantee that the body of every paddle will be exactly as pictured.